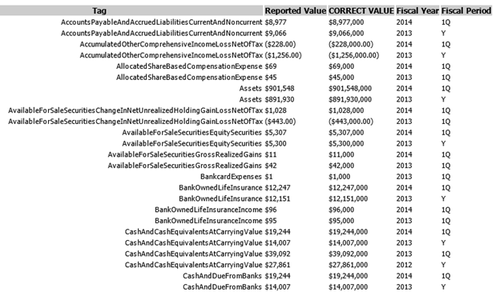 At Calcbench, over the past two years, we’ve flagged and corrected, automatically and by hand, hundreds of thousands of errors or inconstancies in XBRL filings…it’s what we do to ensure we have the highest quality database possible for our users. However, recently we’ve been more active in sharing this information back with the people creating the filings. Last fall we launched our Filer Portal, a complimentary service that XBRL filers can use to check the quality of their filings from our perspective, as well as study their revisions histories, and see how their information looks to an outsider. Unlike other consistency checks, our Filer Portal is the only tool we are aware of that examines all of the information for that company in aggregate in order to find problems such as errors of scales, sign switches, and date errors. Over the next year we’ll keep adding to the Filer Portal to give filers the best info we can about their quality. But we didn’t stop there. Since the beginning of 2014, Calcbench has been sending letters detailing problems we’ve detected back to the company. Below are some snapshots from two such letters. For our full report on the current state of XBRL data quality, click here.